Valdosta, Ga., Sept. 6. 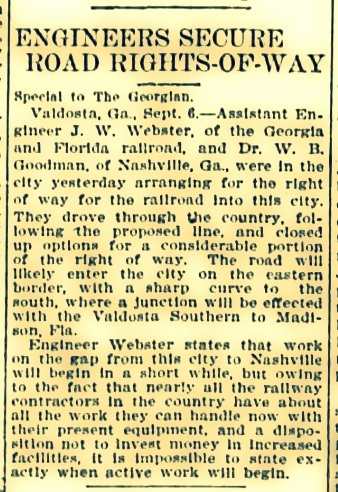 – Assistant Engineer J. W. Webster, of the Georgia and Florida railroad, and Dr. W. B. Goodman, of Nashville, Ga., were in the city yesterday arranging for the right of way for the railroad into this city. They drove through the country, following the proposed line, and closed up options for a considerable portion of the right of way. The road will likely enter the city on the eastern border, with a sharp curve to the south, where a junction will be effected with the Valdosta Southern to Madison, Fla. Engineer Webster states that work on the gap from this city to Nashville will begin in a short while, but owning to the fact that nearly all the railway contractors in the country have about all the work they can handle now with their present equipment, and a disposition not to invest money in increased facilities, it is impossible to state exactly when active work will begin. The call for proposals to build the Georgia and Florida line drew the attention of some of the largest railroad contractors in the country (see previous post Whangdoodled on Panama Canal Contract, Billy Oliver put in a Bid to Construct G & F Railroad Through Ray City). With railroad construction underway all over the country in 1907, the original bids had come in too high for G & F’s liking. But by late August of 1907 it was settled that Schofield & Sons, of Philadelphia would do the grading as soon as their equipment was available to do the work. In the final consideration, there were two possible routes for the G & F line from Nashville to Valdosta, one by way of Cat Creek and the other to run past Rays Mill. 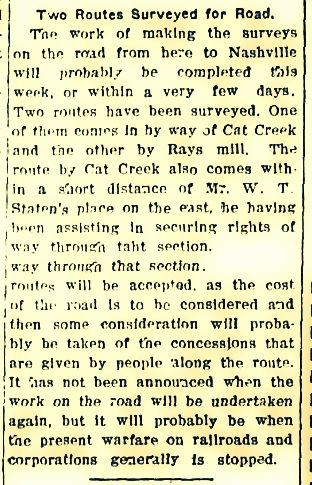 The Valdosta Times, January 29, 1908 reported that two routes were surveyed for the Georgia and Florida line from Nashville, GA to Valdosta, GA. One route would pass through Rays Mill, the other by way of Cat Creek. The work of making the surveys on the road from here to Nashville will probably be completed this week, or within a very few days. Two routes have been surveyed. One of them comes in by way of Cat Creek and the other by Rays Mill. The route by Cat Creek also comes within a short distance of Mr. W.T. Staten’s place on the east, he having been assisting in securing rights of way through that section. routes will be accepted, as the costs of the road is to be considered and then some consideration will probably be taken of the concessions that are given by people along the route. It has not been announced when the work on the road will be undertaken again, but it will probably be when the present warfare on railroads and corporations generally is stopped. Transcription courtesy of Skeeter Parker. William Tomlinson Staten (1866-1920), who was assisting the railroad in securing rights-of-way was well known as the Lowndes County tax collector, president of the Lowndes County Farmers’ Club, and committee member on the state finance committee of the Southern Cotton Association. He owned much property including town lots and plantations. It was Staten who sold lots to the government for the construction of the federal courthouse and post office in Valdosta, GA. He owned a big plantation called “Alue” near Valdosta. He was a big produce shipper so securing a rail route by his Cat Creek plantation would have been in his interest. At that time Mr. J.S. Swindle owned much of the land around the present site of the town. It is said that he bargained with the railroad company to give them the right of way if they would give him a station. This agreement was made and thus started the town [of Ray City]. W. T. Staten would later be among those seriously injured in the 1910 wreck of the G & F train in Valdosta, GA.